McClain’s Makenzie Montavon (26), Maddy Crawford (10), Taylor Butterbaugh (13) and Kaleigh Easter (23) are pictured during Tuesday’s match against Miami Trace. GREENFIELD — The McClain Tigers won a Frontier Athletic Conference volleyball match at Miami Trace High School back on Aug. 30. On Tuesday evening, Miami Trace brought the season series to level with a 3-1 victory over McClain. Scores of the sets were: 25-9, 25-12, 16-25, 25-18. 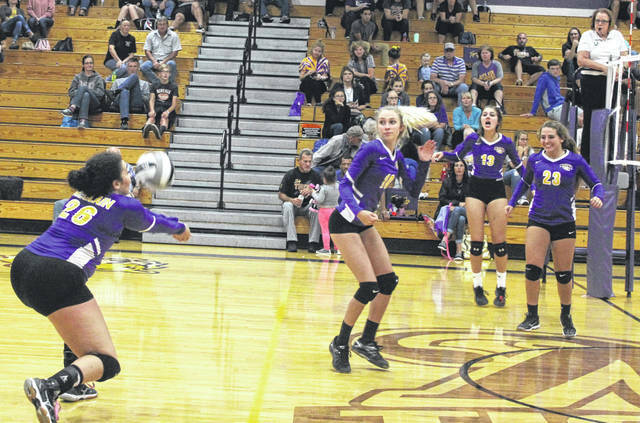 The Lady Panthers were on an even keel against the Lady Tigers Tuesday night. “For us, tonight, it was one of the few times we’ve been able to just go out and play what we’ve been practicing and continue it,” Miami Trace head coach Doug Mace said. “We didn’t roller-coaster as much. We stayed up a lot more. When we did have a few things go against us, we didn’t lose our composure. Statistically for Miami Trace, Laura Robinson had six kills, Taylor Dawson had five kills, Ashley Campbell had nine ace serves and Olivia Fliehman had seven blocks. Miami Trace (2-5 in the FAC) is back in action Thursday with another Frontier Athletic Conference match at Hillsboro. McClain (3-4 in the FAC) is at Chillicothe Thursday. Chris Hoppes is the sports editor at the Record-Herald in Washington C.H., a division of AIM Media Midwest. https://www.timesgazette.com/wp-content/uploads/sites/33/2018/09/web1_McClain-vball-vs-Trace-.jpgMcClain’s Makenzie Montavon (26), Maddy Crawford (10), Taylor Butterbaugh (13) and Kaleigh Easter (23) are pictured during Tuesday’s match against Miami Trace.